Memorial Day Sale going on now through Wed, June 2nd at the Scrapping Cottage!! Just enter discount code extra15 upon checkout. This code applies to ALL items on the website including clearance items. I don't think I could stand on one leg. . even at 29. . . . .But what a great wish. These invitations were made with the Cottage Cutz Flamingo and Daisy Edger Dies. I used the little catch phrase to add a little fun to a 50th party invitation. I used polka dot on the flamingo and the edge of the card and used the Edger Die to border the polka dot. the Edger die is great to add a little bling. The centers of the flowers can be decorated with Genuine Artificial Shinny Australian Crystals. For the inside of the card I used Stickle to keep the card flat, but still bling-y. All you need to do is the Who, What, When invite on Word. . Print and slip into the card and off you go. Just add sprinkles it's your day, I always think a little sparkle on your birthday is in order. This card was done with the Cottage Cutz Ice Cream Cones Die. It cool, it comes with four scoops of ice cream and two style of cones that you can mix and match , build them up and create any size ice cream cone. 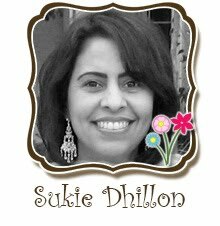 I added old fashion bugle beads to the card as sprinkles, it adds sparkle and texture. You need to glue them down with Glossy Accents for holding power. If you over due with the glossy accents, just add a little Stickle randomly on the sides of the beads, I guess you could call Stickle the opps... concealer. I also added some tinsel cord, by gluing the cord part under the pop outs and letting the tinsel do its job. Don't forget to use a white Gelly Roll pen to add contrast to the cone. Don't be afraid to change a few colors out on the lettering. I doubled a couple of letters with pink on top, but offset the color to let the brown still show. Handmade cards can add such a personal touch and I love to keep some on hand ready to go at a moment's notice. And of course whenever I have the chance, I try to make some birthday cards because you can never have enough birthday cards in your card stash!! I thought the Cottage Cutz Pansy Shape would be a perfect addition to a pretty birthday card that could really be used for any occasion. 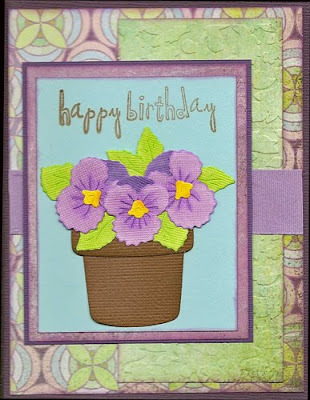 I coordinated the purples of the pansy blooms with my patterned paper using my Copic markers. 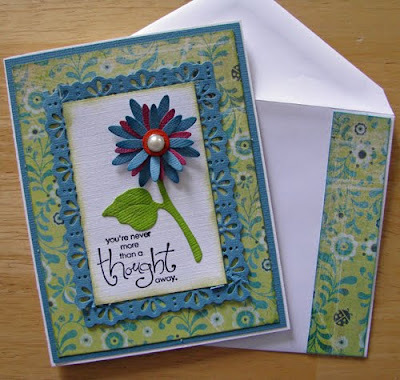 This is a really easy shape to piece together which makes creating this card that much easier! I hope everyone has a wonderful Memorial Day Weekend!!! Thank you to everyone who entered the sketch challenge. All of the layouts were fabulous, it was hard to pick just one winner. The winning layout was sent in by Marie McKinley from Cypress, TX. 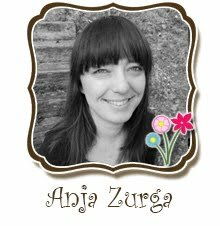 Here is her adorable layout, showcasing the NEW CottageCutz Pet Release dies. Congrats Marie! 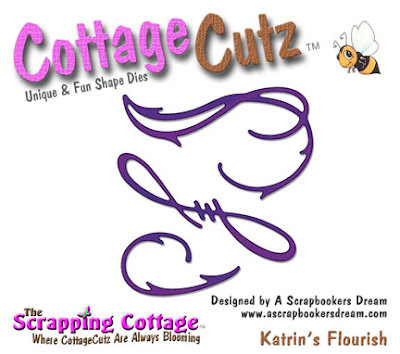 Please email your choice of any in stock CottageCutz dies, totalling $20, to scrappingcottage@cox.net along with your name and address as well as your blog name. I wanted to created another layout using the CottageCutz Seed Packet Frame, to show all the fun ways to use this versatile die. I think this is my favorite die from this release. One of the reasons it is so special is the embossed framing that runs around the die. If you haven't picked one up, I really recommend you do. 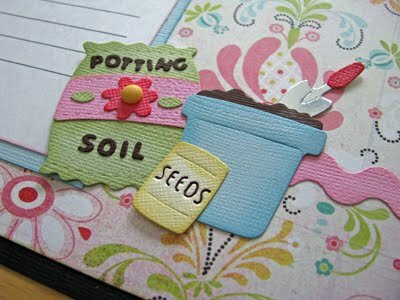 *Use it as a seed packet with the different flower dies(this release). *Use it to frame small wallet sized photos. 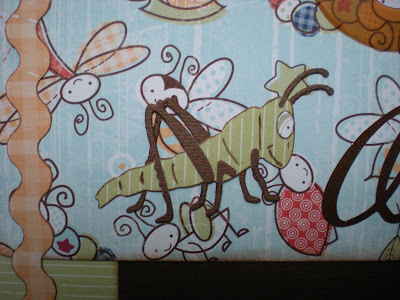 *Use it as a journaling block, cut it out of lined paper or use a stamp to add lines. *Use it as a seed packet or sign for fruit or veggies(as I have done on my layout). *Use it as a tag, punch a hole and add some ribbon. I hope you get some creative time today! My tip for today is a quicky but it is something new I have recently started doing with my Cottage Cutz Dies. I don't know how you store your CC dies, but I like to store mine with the cute cover that comes with them so I always have a good reference to look at when it comes to putting the shapes together. Plus, it also makes it easy to find the shape I am looking for as well as keep track of which shapes I already have. What I have now started doing with my covers is using the backs, too! This is where I like to keep ideas, titles, sayings, etc. that I think would work well with that particular shape. I don't necessarily write down "obvious" uses, but more out-of-the-box kinds of things. Ideas I have seen or thoughts I have had about the dies that I know if I don't write down, I'll never think of it again! 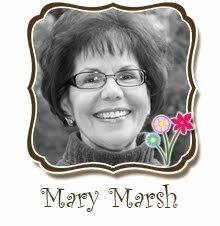 I am all about trying to get the most bang for my Cottage Cutz buck so I never want to forget a good idea! 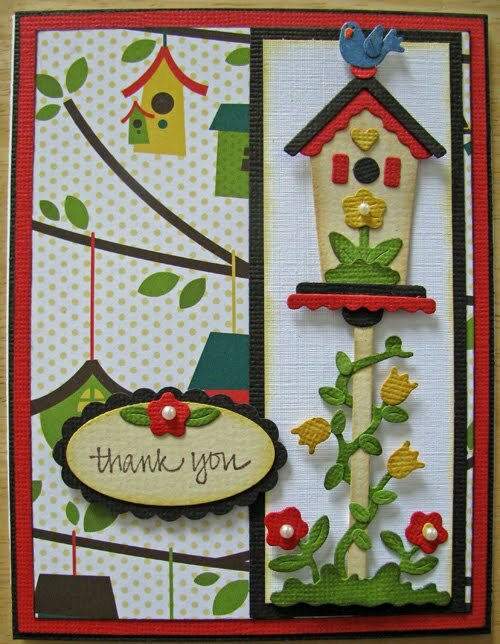 One example is with my Cottage Cutz Froggy die I used a couple of weeks ago to make the Get Well Card. On the back of the cover I have written down phrases like, "it's not easy being green", "Go Green" (Earth Day), morning sickness get well card, etc. Just some fun things for which a frog would be perfect! I challenge you to pull out some of your dies and try to brainstorm some new ways to use your shapes or just make a list of the layouts or projects for which you already know that you want to use a particular shape. This activity is also a great way to get your creative juices flowing if you are having trouble getting your crafting mojo going. Be sure and let me know which Cottage Cutz Shape you pulled out to play with today!! 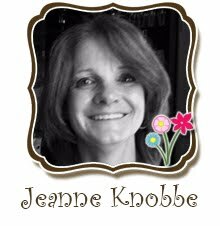 Check back tomorrow for another fun and fabulous project from Karen! Today I want to show you a couple of simple cards I've made with CottageCutz dies. I usually take quite a bit of time in making a card, but there are times when simple will do. 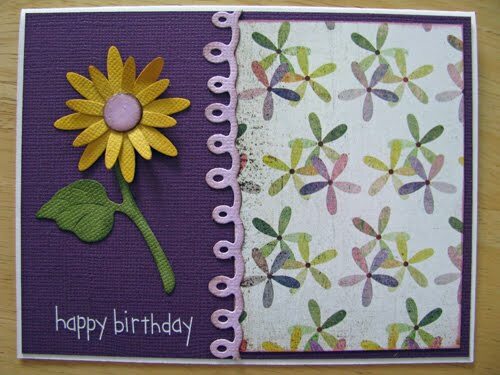 For my first card I used the Flower 3, Layered die. You can create several different looks with this one die. My favorite is layering the small and the large pieces together. Is also used the Loops Edger on this card. Love these Edger dies!!! SO fun! This Pot of Sunflowers die takes a little longer to put together than the flower above, but I love how it turned out. I wish you could see it in person, the color and detail don't always show up in a picture very well. Here's a close-up of the sunflowers. Join us back here tomorrow for Ruth Ellen's Watch for it Wednesday post! This card was created to be used as a gift card presenter. I used the Cottage Cutz Frog on Lilly Pad Die. I had first made the card so the gift card would fit in a slit in the cover of the card,so when you opened the card the gift card would be facing you to the left, in fact to can see the slit when the card is open behind the B and Y in the birthday words. 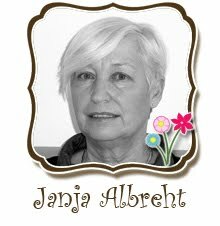 I showed the card to a friend and she said she did not like the gift card showing behind the Happy Birthday cut out words. Sooooo I decided to add the swinging flap style pocket and it does work. When you open the card the slap tends to swing out. I also added a fly to the gift card itself. I wanted to create a nice Thank You Gift that included cards that the recipient could use as need. This time I used the Cottage Cutz Daisy Die to create four simple cards, matching envelopes that could be presented in a matching stand. All you need to do is drop the set into a tall cello bag, gather it at the top, add ribbon and a daisy. Ready to go gifts for any occasion. I started with four cards, and choose two colors that would coordinate . Cutting random wavy stripes, Two cards vertical, two cards horizontal and altering color combinations. In this case mounting the flower on white cardstock and randomly cutting odd shape rectangles (no measuring). Mounting on black for a dark frame. Punching a hole and attaching a silver (tin) charm with twisted wire and bead. The charm, wire and bead adds dimension. The card holder was made from foam core board, covering to match the cards. Notice the side I added just the flower centers with the greenery. 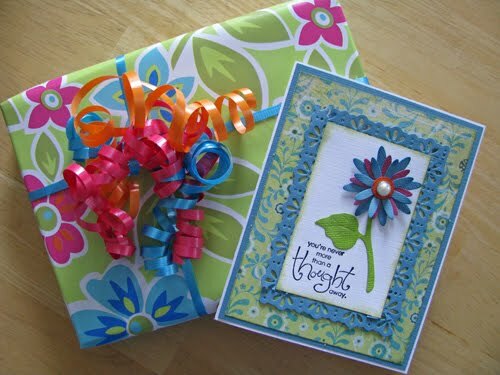 The envelopes were sponged with the inks that were used on the cards and a Daisy was added to the flap on the envelopes. This brings together a nice combination. I hope everyone is feeling happy and scrappy on this Friday morning!! Today, I am featuring the Cottage Cutz Ric Rac Edger die and the Grasshopper Die. In order to create a 12" long strip with the ric rac edger die, I used the same technique I demonstrated on my last Watch for it Wednesday post. If you want to see that technique again, just click here. This picture is of my adorable new nephew when he was just a few days old. It is so fun to have a little boy around for me to scrap! Don't forget about the contest we have running right now! Check out the sketch from this week's Watch for it Wednesday post and use it to create a layout showcasing one of your favorite Cottage Cutz dies (as if you can really have just one favorite!). The entries so far are really cute so keep them coming!! Who couldn't use a little free spending $$$ at the Cottage!! So don't miss your chance!! I hope you all are working on your sketch layout and the chance to win that $20 Gift Card to the Scrapping Cottage. This spring release has been one of my favorite releases so far. There are so many wonderful dies! These are the NEW CottageCutz dies I am showcasing today. I did a two page layout. I included the pages separately so you can see the details. For my layout, I used the NEW CottageCutz Scallop Five Edger...so pretty! 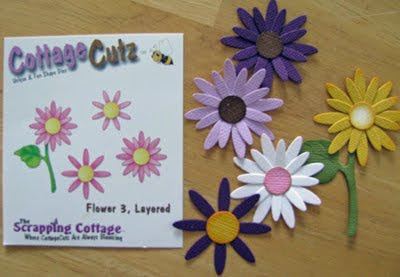 I also used the NEW CottageCutz Seed Packet Frame die and the NEW CottageCutz Poppy Seeds die. The frame I used with the Poppy seeds but also as a frame for my smaller photos...such a fun idea. I hand cut some clouds and added a few butterflies. I wanted my page to have a fresh happy feel. The new spring dies were the perfect accents to complete my layout. 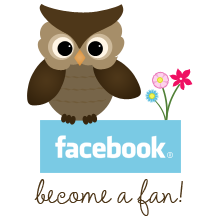 Today you have a chance to win a $20 Gift Card to the Scrapping Cottage! We are having a fun Sketch Challenge! This is a great way to not only be entered in the drawing for the gift card but also a way to inspire you to get a layout completed. We want to see what you can do with the sketch, showcasing your favorite CottageCutz dies. 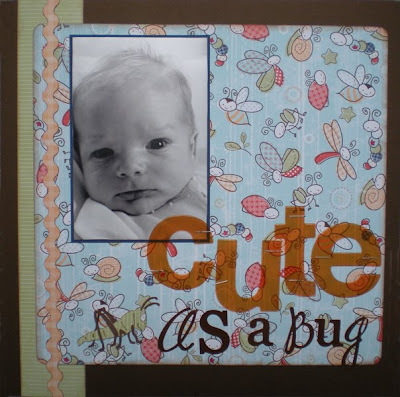 Create a layout based on the sketch below using your favorite CottageCutz dies. Email a copy of your completed sketch layout within one week to scrappingcottage@cox.net. The winner will be announced in next Thursdays post(5/27/10). I used the NEW CottageCutz Loops Edger and the NEW CottageCutz Grasshopper & Caterpillar die. Good Luck with the Sketch Challenge! I just love Spring - one of things I notice this time of the year is all the birds chirping out my window and watching them land in all our trees. (I won't comment on the ones trying to build a nest in my dryer vent...) My sister had a wreath on her front door and a bird made a nest in it and laid three eggs. Guess we should have a cute birdhouse like the one on this birdhouse die sitting in our yards. When I saw this cute Pebbles birdhouse paper I knew it would be perfect with this CottageCutz Tall Birdhouse. This die comes out so cute and has several possibilities. I added some tiny pearls for the centers of the three flowers for a little dimension and used mounting tape to pop it up a bit from the paper. 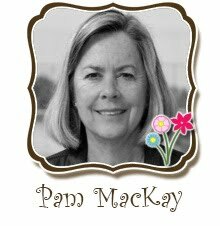 I cut out an extra flower to add to the thank you oval. If there are any questions you ever have on thise CottageCutz dies please ask, we'd love to help! Hope you have a beautiful Spring day! 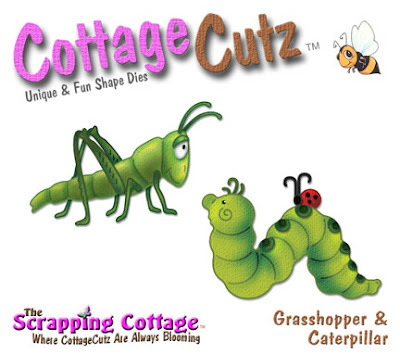 If you haven't looked at the newest Limited Edition Cottage Cutz die, now is your chance!! This die was a custom creation that is now available in limited quantities. Don't miss out!! Indulge yourself with a little ice cream with not bad press. This card was made with the Cottage Cutz Ice Cream Sundae 2 Die and the background stripe was made with the new Cottage Cutz Rick Rack Edger Die. I also used polka dot paper for the chocolate topping, thought this would add a color contrast. The closeup photo will show how again I used the palette knife to add the darker pink to the ice cream glass. Hello All, I had a question about how I shaded the darker yellow on the MOM Yellow Rose Card from last week. So I hope these notes / photos will help. I am still an Ink / Chalk person when it comes to shading. 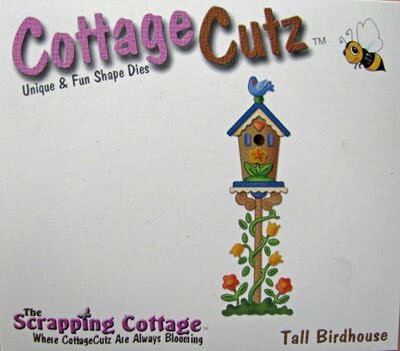 What is SO GREAT about Cottage Cutz Dies is that they cut the design lines completely through the paper. What purpose does cutting completly through? . . in this case it really does help? As you can see I use an Artist Palette Knite to insert in the cut area and block an area of the paper to sponge the color on the design line. This will give you a perfect color line to bring out the design. In this case you just remove the knife and work it around and follow the design to the center. When you have completed the inside lines, than place the flower on the top of the knife and work the color around the edge. Rotating the flower to the tip. Because the knife is flexible, when you are sponging the color on the knife the tip will bend and cushion the pressure you use to apply the color . .and give a soft hue. If you have ever tried to do this in your hand, you would dent your paper up and if you lay it on a hard flat surface, the pressure from applying the color would come out to dark and solid. What the photo does not show, it that I also highlight the design area's with a Sakura Gelly Roll "Clear Star" pen. The key to this pen is once you draw the line, quickly tap your finger (don't rub) a couple of times. This will break the solid line that the pen draws and you will have a mist of sparkle in the area. So many people will not use the pen because they do not want a solid line showing, but by tapping it you break that line up. (you also get a glimmering finger tip) LAST NOTE, buy the metal pallete knife, not the plastic ones, they are thick, not wafer thin like the metal ones. 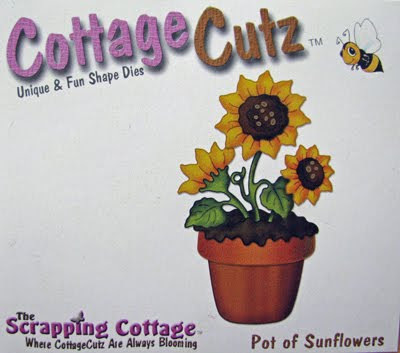 The NEW CottageCutz Garden release is perfect for all your spring photos or projects. 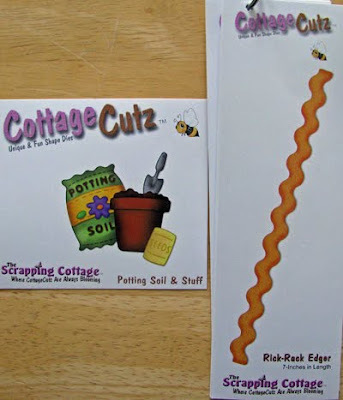 Add some NEW CottageCutz Edgers into the mix and you are sure to create something special. 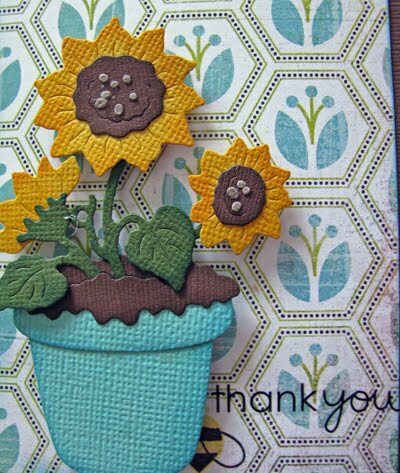 For my layout I used the CottageCutz Poppy die without the seed packet. It was the perfect accent to my title. I added one more CottageCutz Poppy on the tag in the corner. Since I created this layout before reading Ruth Ellen's fabulous tip for cutting 12" CottageCutz Edgers, I just overlapped my Edgers. 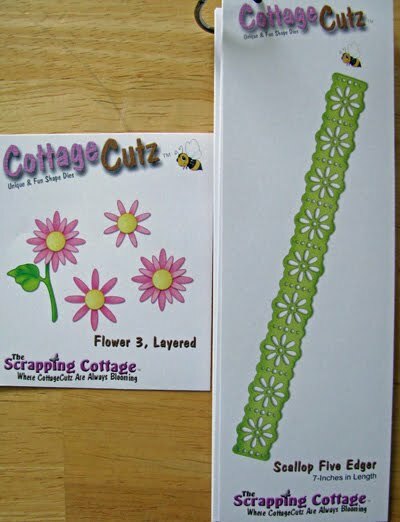 The CottageCutz Eyelet Edger is a must have, it is something you can use on a variety of layouts or cards. My tip for today is Dual Purpose Layouts. My daughter is doing several different projects for church and each one needs to be at least 10 hours of work. 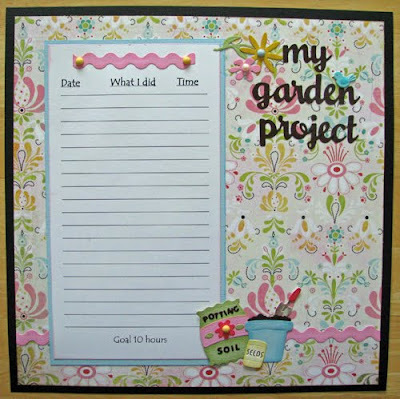 I thought that by making this cute chart for her to keep track of her time would make it more fun, then when she's completed her goal of taking care of a garden for 10 hours we simply slide this into a sheet protector and put it in her scrapbook. There's room for a picture too. These dual purpose layouts would be great for job charts, school projects, birthday banners or any party type messages. This CottageCutz Potting Soil & Stuff die is super cute and I love how it looks on my chart layout as well as the Rick-rack Edger. You'll always have the perfect color of Rick-rack with this edger on hand. I love my CottageCutz dies! What is your favorite way to use your CottageCutz dies??? We'll see you back here tomorrow for Karen's wonderful project. My card today shows the Scallop Five Edger and the Flower 3, Layered dies. A fun thing to do is to match your patterned paper to the wrapping paper you are using for your gift. I picked up this pretty spring wrapping paper the other day at the store and wanted my card to match. I was able to find this patterned paper that went pretty well with my wrap and went from there for the flower. For the edger I cut out 4 pieces, punched out the holes and attached to the sides of my inside panel. This allows you to border just about any size piece you want. Join me back here tomorrow for my Watch for it Wednesday post on dual purpose layouts. Oops . . . Did I get a little on you?